Dr.Malpani's Blog: Difference between hope and false hope: what every IVF patient must understand! 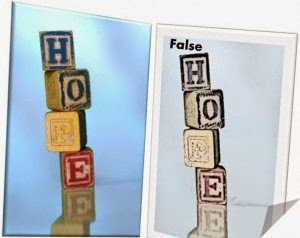 Difference between hope and false hope: what every IVF patient must understand! Every woman steps into the world of IVF with the hope that IVF will give her a deeply desired baby. Unfortunately not everyone who undergoes IVF ends up with a baby to take home . Every IVF cycle provides you with a 40-50 % chance of getting pregnant (this success rate is for young women with good ovarian reserve provided they are with a good IVF clinic, their uterus does not have any obvious defect and their partner is fertile) . The take home baby (live birth ) rate is even lower ! Women who are of advanced maternal age (greater than 35 year old) and women who produce only a few eggs due to poor ovarian reserve have a lower chance of success. This is the bitter truth. We all need hope to stay motivated. The motivation to fight the unknown and the inspiration and energy to deal with uncertainty definitely comes from hope. No one will step into IVF treatment without hope and motivation. But when hope turns into false hope and delusion, patients are headed towards heartbreak and pain. I even find searches like this leading to my blog – ‘my IVF cycle failed, I want to suicide’. If a failed IVF cycle triggers the desire to end one’s life then readers must understand how huge the emotional turmoil the patient might be undergoing! Another search word I frequently see is – how to cope with a failed IVF cycle. What makes coping with a failed IVF cycle so difficult? What is the difference between hope and false hope in the context of IVF? Does the same hope which provides the motivation to fight steal the courage to face the failure? The field of IVF is highly commercialized. Many IVF specialists sell false hopes in order to lure patients to their clinic. Also, because of their extreme desire for a baby , many IVF patients become delusional and live with false hope. They look at IVF with rosy lenses because it’s their last chance and desperation makes it difficult to think clearly. They over-estimate their chance of success - and back up such false hopes with unrealistic facts and expectations. There are many ploys they use to justify this false hope. - Statistics are fine, but they don’t apply to individuals, and because I am healthy and fit and god-fearing, God will definitely give me a baby. Are these women just fooling themselves ? When undergoing IVF, hope must be based on reality and facts. You must cultivate hope based on sound scientific evidence. False hope can be cruel , because your heart breaks when you are forced to encounter harsh reality. She produced only 1 or 2 eggs in her IVF attempts and her embryos arrested after day 2. She has a very high FSH and low AMH. It clearly shows that her ovarian reserve is nearly depleted and the genetic competence of her embryos is poor. But she insists that she doesn’t want to use donor eggs and will try acupuncture to improve her egg quality so that she can get pregnant. Now until she produces eggs which could be fertilized and give rise to a healthy embryo, there is no chance for a pregnancy. Now the question is - how high are her chances? If we look at the figures from IVF clinics all over the world, her chance of success using her own eggs will be less than 3 %. That is, if 100 women of her age and diagnosis undergo IVF, one to three one might get pregnant and the chance of a healthy offspring is much lesser, because the miscarriage rate is very high in these women ! IVF is costly; and the emotional and physical strain it can put on someone is high as well . In such a situation how many times she will be able to play the IVF roulette without becoming an emotional wreck, especially, when there is only a miniscule possibility for a favorable outcome? Her false hope stems from two aspects: her desperation to have her own baby and her willful ignorance. While denial can be a useful protective mechanism, it can cause a lot of harm. She fails to understand the reality of scientific data, and is living in a fantasy land (because of her dreams of having her own genetic baby , and also by reading many anecdotal success stories) . She is hopeful that if she tries acupuncture ( or any other therapy ), a miracle will happen. This is also the case with many young women who have very poor ovarian reserve. One must understand that miracles do happen but very, very rarely – and this is why they are called miracles ! Exceptional stories like that of the author of Inconceivable do happen , but it cannot become the norm! Not every woman who has a high FSH level conceives after making ‘adequate’ life style changes. Sadly, we never get to read their “ IVF failure stories “ ! Relying on such anecdotal stories and ignoring sound scientific data is like buying a lottery ticket and waiting to become a millionaire , just because someone else you know has won a huge jackpot. Any rational human will agree that it is utter foolishness to do so. In short, because of your desperation, you are allowing someone else to laugh all the way to the bank - and even worse , you are doing so by emptying all your hard earned money! This kind of over-optimism will not only harm your bank balance , but also your emotional well-being. A good IVF doctor will clearly explain to you your low chance of success and will advise you to consider alternative, such as using donor eggs. He will not lure you into trying unproven expensive therapies , such as immunotherapy . In fact , some genetic tests like Preimplantation Genetic Screening (PGS) have been shown to decrease the chance of success in older women undergoing IVF, even though the IVF clinics which offer them promise the moon! In short, a good physician will not sell you false hopes by overstating your chance of success. Please be happy when you meet a doctor who is honest with you because he is the one who genuinely cares for you. Do not get taken in by sugar-coated words by doctors who are trying to sell you their expensive services. Remember, a cruel truth is always better than false hope. You must let go of false hope and fill yourself with acceptance of your real situation. This will be the best step forward to bring peace and happiness , and it will also help you decide wisely about your next steps. There are also young women with good ovarian reserve who have highly unrealistic expectations about IVF. They believe they will definitely succeed in their first IVF cycle. They think only of a successful outcome and shun all thoughts about a negative outcome. Many believe that even thinking about a negative outcome will jinx their chance of success. Some put all their faith in God and obsessively pray 24/7 for their IVF cycle to succeed. When such women face failure , they find it very hard to cope. Facing success doesn’t need any prior preparation but for facing failure you have to prepare your heart and mind beforehand. You have to develop effective coping strategies to face IVF failure, just in case your cycle does fail. Seeking strategies to cope after a failure will not work effectively. Even if you are young and have good ovarian reserve, your chance of success with a good IVF clinic is just 40-50%. This means your chances of failure are as good as your chances of success. Statistics show that 60-70% of women succeed within 3 IVF attempts , while others will not conceive at all! You will understand the need to have a plan B if plan A doesn’t work. Blind hope will only lead to depression and enormous emotional pain. If you don’t learn to deal with the possibility of failure by designing proper coping strategies, the fear of failure itself can stop you from pursuing your dream. It appears as if false hope is what gives you the strength to fight, but what it actually ends up doing is leaving you emotionally drained after the IVF roller coaster ride. A balanced sense of hope is extremely important , so you don’t drive yourself insane. Realistic expectations come only when you educate yourself thoroughly. A realistic hope is flexible as a negative result does not break you , but helps you to cope better , so you can make optimal use of all the options that are available to you in the field of IVF. A realistic hope admits uncertainty. When false hopes come crashing down, you are likely to be resentful and angry – and you will often need to vent this on the IVF doctor who helped to create some of the high expectations. A realistic expectation of IVF is not always a baby , but receiving good medical treatment , and making use of all the scientifically sound options that are available to help you to reach your dream. IVF doctors have an important role to play. They must realize that it is extremely cruel to sell false hope to their patients who are fighting to have a baby. IVF is usually a happy specialty because we help to create life. However, we do sometimes have to give bad news to patients, and this can be hard to do. For example, what do you tell a 45 year old woman who has failed 3 IV cycles and has a high FSH level and wants to do one more IVF cycle with her own eggs. By telling her chances are slim, are you being unfair and unkind by depriving her of hope ? By saying No, you are passing a death sentence in one sense – the death of her dream of having a baby with her own eggs. Is it better to be frank and forthright ? It’s no fun having to counsel patients who are not willing to listen to the truth . It’s much easier for IVF doctors ( and more profitable too !) to go along with their patient’s wishes, even when the chances of success are zero. A lot depends upon the maturity of the doctor – and the patient as well ! Is the patient willing to absorb the truth ? Does she understand that only an upright medical professional will tell her what’s in her best interests, rather than try to sugarcoat the truth ? Does she trust her doctor ? Has she done her homework ? empathetic , if you can weather this storm in your life. Poor ovarian patient have less chances thats why they dont try ivf you are said. Who knows every one need only one good egg. some times miracles happend. manju tried to so many times finally she getting pregnant. why dont try all others like her. older women going to plan B.thats ok. but why dont try younger women. educated women knows their exceptaions. they dont blame their doctors. lot of women drop up to three cycles. very less women try more than 5. who knows what happend tomarrow. I tried 6 IVFs and 3FETs and my diagnosis is not poor ovarian reserve, I have to do IVF because of tubal damage. I had to do so many IVFs because initially I took treatment in a country where IVF success rates are poor due to several reasons. I was naive at that point and I falsely hoped that getting treatment there is enough for conceiving a baby and the cost of it is 5 unsuccessful IVF cycles ! That is why it is important to be well-informed . But when I went to Dr. Malpani, I conceived with the eggs retrieved in a single IVF! What this article says is, when women have poor ovarian reserve and if they produce only few eggs (less than 5 eggs) and if their embryo quality is poor and if no pregnancy is achieved even after 3 IVF cycles with a good clinic, it is better to look for other options like donor eggs which will brighten their chance of a healthy pregnancy. If you argue, I will try IVFs and IVFs until I produce eggs, it is OK too. No one can say no to it because it is your personal preference. But understand clearly, miracles happen but very rarely. You might get pregnant next cycle or in the 50 th cycle or not at all. At some point you must come to an acceptance otherwise it is difficult to live sane. If you keep on insulting your body and mind with unrealistic expectation at one point you will not be able to fight for what you desire most, you will lose your desire to have a baby. You can't keep on saying that miracle will happen to me one day similar to a person waiting for a lucky draw to make him rich. The point of this article is not to say that people blame their doctor for failed IVF cycles and hence they must have realistic hopes and move on to other options. The point here is, having realistic hopes about IVF will protect you from financial, emotional and physical strain! Do not live in a delusional world and spend your hard earned money by doing IVF and after IVF without success. Educate yourselves clearly about your chance of success and if a wise doctor asks you to try donor egg then please do not turn your anger towards him/her for saying so, because it is a reasonable advise! I think I have set a wrong example unknowingly: I will never say try and try no matter what ... I will say, do your homework, have good knowledge about your chance of success, accept your diagnosis, have a open mind and explore all treatment options which will give you a decent chance of success. True, everyone needs only one good egg but how far can you go to get that one egg when your real chance of having that one egg in 1 in 100 ? I hope you see my point, perhaps Dr could give a better answer. How to know whether I have realistic hope or not ?